Enjoy the breathtaking views of the ocean and feel breeze while sitting on your balcony listening to the sound of the waves. You are only steps away from the waters of the Atlantic ocean where you can swim, surf or stroll along the beach. from your private balcony, you can watch the sun rise over the ocean or sit at night and enjoy the stars over the ocean as the lights from the distance ships pass by. The pool is surrounded by a see thru gated fence which you will have the key so you can sit overlooking the beach or Stroll down the beach. Whether your here for a relaxing vacation or to enjoy the thrill rides, jet skis, parasailing, helicopter rides or fishing, Daytona Beach offers something for everyone. Centrally located next door Sun Splash park where kids can play in the fountains made to play in for free. Main Str. the boardwalk and the Pier where you will find restaurants, rides, water park and movie theaters. Our Unit is privately owned so you get the personal feeling of being right at home with a memorable stay. The condominium is fully equipped with a cable TV DVD ,linens and towels. The kitchen is equipped with a 2 burner stovetop, microwave, toaster, refrigerator, coffee maker, dishes, pots and pans. 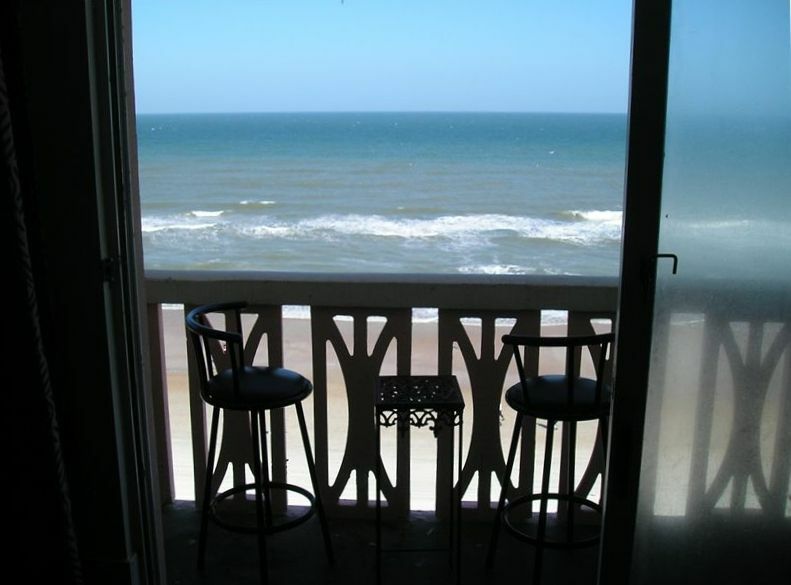 table & chairs, dresser and balcony table with 2 bar stools so you can get the best view in Daytona Beach from your own balcony. Monthly rates are based per calendar month not split between 2 months. Hi we are Dan and Robin Weeks we have owned this Condo since March 2004. We live in Florida and love spending a lot of our time in our condo on the Beach. Dan was born in Florida and Robin has lived in Florida for over 30 years originally from Ohio. Real Beach front property Wonderful view from your own balcony looking directly down on the Beach and pool. 8th (top) Floor One of the largest pools in Daytona. Security at the building and the pool. Very safe and comfortable place. Close to boardwalk and pier. Nice location on the water. Nice view of the ocean and listening to it every day. Everything clean and well taken care of...The only thing would be more privacy on the balcony with walls on each side. Not sure why it was never built that way but I'm sure it could be done. Thanks Andrew, yes I agree the divider walls on the balcony would be nice and I would certainly build one if the association would let me. We really enjoyed being on the 8th floor looking down at the beach and enjoying the wonderful breeze. The condo was very clean and cozy and seemed to have everything we needed for a great stay. The owners made sure we had all the info we needed and was available for any questions . Can't wait to return again next year. I am glad to hear you guys had a good time and Robin and I would love to have you guys stay with us again. This is our second time here and each time we are mesmerized by the view from the balcony on the top floor of the building. We enjoyed getting up every morning drinking coffee on the balcony watching the sun come up and drinking Margarita's in the evening watching the Pelicans fly by a few feet from us. The condo is not very big but was perfect for the 2 of us. It was very clean and cozy and we just loved the new enclosed shower that was built since we was here last time. The owners were very nice and made sure everything was perfect for us upon our arrival. The overall building was very well kept and the hot tub was certainly a treat on cool nights. We will definitely be back next year and hopefully can stay longer. The building is quite old but it is maintained well and the management staff are courteous, thoughtfull, and very professional. I stayed here for 4 weeks in January 2019 and felt very secure and safe in this building. Although the unit I was in was adequate for my needs there were several issues that the owner should have attended to before my arrival; the microwave was disgustingly rusty on the inside and smelled of burnt plastic, the shower valve appeared to have been adjusted so that the water temperature was only lukewarm, the shower drain was obstructed and allowed water to back up in the stall, the toilet did not flush properly, there was an inch of dusty fluff under all the furniture, the screen on the patio door had a big hole in it, all the furniture was very shabby, the fold out sofa has a 2" wire spring back-killer mattress.... The owner of this unit needs to look at the other rentals in this building to understand the standard of cleanliness and presentation that other owners are offering to their guests. If I return to Daytona Beach for a holiday next year I will call the front desk, ask to speak with the building manager, (not the one associated with Westgate Resorts) and get her recommendations for rental units. I was not aware of the screen being cut. I will certainly replace the microwave also. Being on the ocean I know things do get rusty, as far as the the slow draining there is a maintenance man there that would have taken care of it if you would have said something. The couch was just purchased this year along with the Mattress. I personally thought it as very comfortable, unless you or referring to the sleeper in the sofa and my opinion I have never found any of them to be comfortable. Then again I am sorry that your stay was not satisfactory for you but i do believe communication would have made the situation much better. Thanks Glad you enjoyed your stay. From start to finish, we felt at home. It is a beautiful view, well kept and friendly. Great place to stay if you like an ocean side room. Thanks it was a pleasure having you guy's stay with us.